Swapping Twitterberry for Ubertwitter was one of the best decisions I've ever made in my life, but even that has its shortfalls. 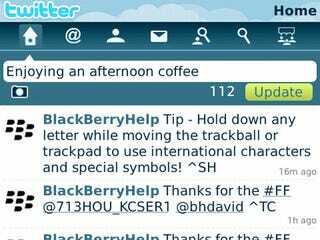 BlackBerry's impending Twitter app looks heaps better, from the design to actual usability. It's not available yet, but you can sign up for an invite code for the beta launch later this year. I haven't tested it out yet on my Bold 9700 as am juggling another phone today, but I'll definitely be giving my thoughts on it next week after trying it out properly (read: tweeting about my cat). In the meantime, let's look at some of those features. You can compose a new tweet from the feed of updates, rather than having to go to a separate screen like in most apps. It's compatible with a lot of the native BlackBerry programs, enabling you to send a URL from the browser to Twitter (automatically resizing it to a bit.ly link), with the same process possible when taking a photo, using the Twitpic service. The navigation icons at the top are a heck of a lot cleaner and more in keeping with the BlackBerry UI—as you'd expect, considering they developed it. From left to right, the icons include help, replies, your profile, direct messages, search for a user, search (which lets you filter by proximity), and trending topics. Direct messages are pushed through instantly, and the official retweet function is supported by the app. Whether that's a good thing or bad thing, I'll leave it to you to decide, but I personally can't stand that new recycled retweet feature. Nothing worse than seeing someone's face in your feed, who you unfollowed long ago. Or maybe that's just me.